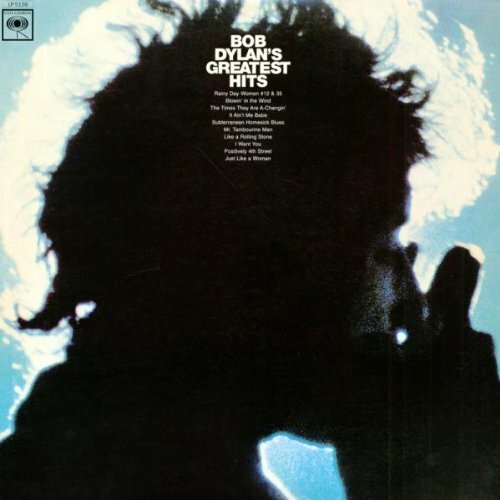 Bob Dylan’s Greatest Hits was released in March 1967. I wasn’t really going to talk about this album, since I’ve written about just about everything that can be found on it, but it seems that this is the only Dylan album that I have two vinyl copies of, which deserves comment. At the time I was buying Dylan on vinyl, I really didn’t have much use for this album since I had everything else one way or another. The exception was “Positively 4th Street”, which was not on any of the studio albums, but which I did have on Biograph. I did actually buy a copy in a used record store for $5 (the sticker is still on it), probably just for the sake of having it. It is a perfectly good collection. It has most of Dylan’s singles up to that point in time. I can’t quite figure out the thinking that went in to the ordering of the songs (it starts with “Rainy Day Women” and then moves to “Blowin’ in the Wind”, so it is neither chronological nor arranged in terms of impact, since side one ends with “Like a Rolling Stone”). Greatest Hits albums like this one generally leave me cold. Almost any performer that I’m interested in has songs that I greatly prefer to the “hits”. Biograph does a much better job (and given that it has five vinyl albums, that should obviously be the case) of mixing hits with important non-hits in a curated way. If I made a list of my top ten Dylan songs up to 1967, about half of them wouldn’t appear here. Two of the most recent live shows I’ve been to have been all hits – nostalgia shows. Last year I saw Prince at the Saddledome and he basically told us it would be an all hit show. Indeed, at one point in the (great) show he yelled “Calgary! We have so many hits we’re going to be here all night!”. It was true. He did about twenty songs, and they were all familiar. We were all middle-aged and happy to hear them, so it was great. Similarly, The Dixie Chicks, who are not really together any longer, did a show at the Saddledome in October where they announced that they were doing all of their hits in chronological order. People were happy, but they have a lot of stuff that I’d have rather heard. By the time Dylan’s Greatest Hits came out he wasn’t singing all of them any longer. He’d given up on “Blowin’ in the Wind” and “The Times They Are A-Changin’” on the 1966 tour. The album, bizarrely, doesn’t contain “A Hard Rain’s A-Gonna Fall”, which was not a single, but would be the most notable song left off. He would come back to all of this material in the 1970s, but in an entirely different way. The fact that I have two vinyl copies of this album is indicative of the fact that it is the only Dylan album that Rebecca brought into our relationship when our record collections merged. Recently rifling through those boxes, it was interesting to note the places where we had two copies of things – all the early Patti Smith albums, The Waterboys (Rebecca’s favourite band back in the day), REM… Rebecca had the Dylan because you sort of had to have it, which is what that album is for.